Solid silver fish eaters for 18 people, made by Bruckmann & Sons Silversmith, Heilbronn in Germany. The handles are of an Art Nouveau design, with a blank cartouche on the front, the blades with a beautiful hand engraved decoration. The handles and blades are solid silver, the handles have no weighting or filling, and therefore will not separate. 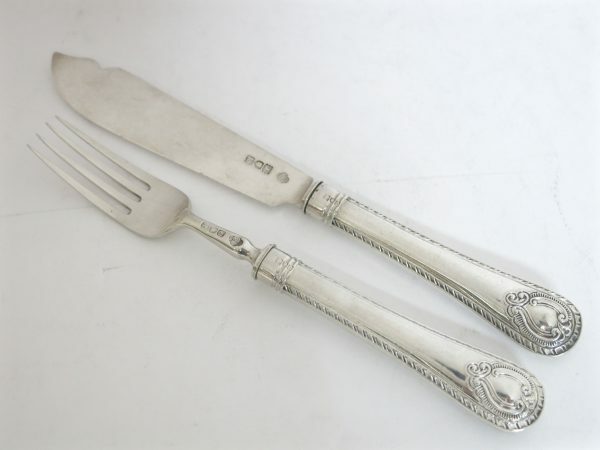 Each knife and fork are clearly marked on the rear with the German 800 silver mark, the half moon and crown, and the symbol of Brickman silversmiths. Date circa 1890. Can also be used as an hors d’oeuvre set. The 36 pieces are fitted into three trays in the original well worn case, although the flatware itself is in very good condition. No monograms or initials or removals Knife measures 8 1/8″ long, fork is 7 1/4″ long the case is 15.25″ x 10 1/8″ x 4.25″ high. Superb, Antique English, Sterling Silver, Chased & Pierced Vine Set. 38 Pcs. Chased & Pierced Vine Pattern, Antique English, Sterling Silver Boxed Set For 18 People. Made By George Adams, The Premier Flatware Maker Of The Victorian Period. Handles & Blades Are Sterling Silver And Hallmarked, As Are The Grape Shears & The Sifter Spoon. Set Consists Of 18 Knives 8 1/8″. 18 Forks 6 2/3″. Grape Shears 7″. Sifter Spoon With Pierced Vermeil Bowl 6″. London Circa 1872. Box Is Approx. 14.6″ x 10.1″ x 3″ High Chased and Pierced Vine pattern was first produced by the great Victorian silversmith Francis Higgins for the Great Exhibition of 1851 held at the Crystal Palace in London, as is now recognized as one of the most extraordinary silver flatware patterns in the world. Each piece of silver flatware is individually hand-forged, and then very carefully chased, entirely by hand, in the shape of interwoven grapes and vines. This magnificent silver flatware is exceptionally heavy, and brings the height of luxury to your dining-room. Antique English, Sterling Silver & Gilt, Boxed Set With Pearl Handles. 36pcs. 36 piece set, in fitted case. 12 knives & 12 forks with sterling silver vermeil blades and pearl handles, the 12 spoons are all sterling with vermeil. The spoons with hand engraved crest. The knives hallmarked Matthew Boulton dated 1812, 8″ long. The forks ib dated 1879, 6.5″ long. The spoons by George Adams, 1879, 6 5/8″ long. All fitted in box, 18.75″ x 9.75″ x 3.5″ high. The box showing signs of distress on cover. Set was retailed by Burfitt antiques on Albemale street in Piccadilly London. We have found catalogues printed by Burfitt, an exclusive antique gallery in London, from the early 1900s through the late 1930s. 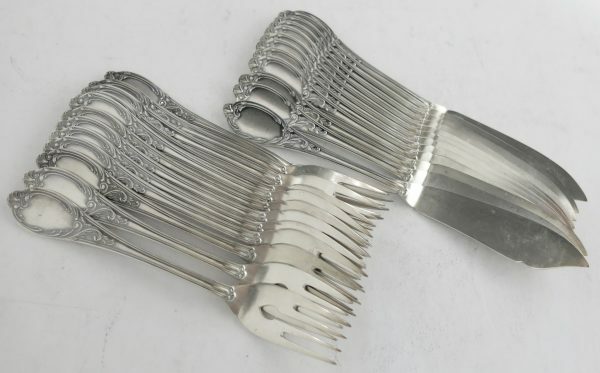 English, sterling silver fish knives and forks in the rare Bateman pattern by the premier silversmiths CJ Vander. These are solid silver, handles and blades and are not weighted or filled. Set of 12 knives and 12 forks. Typical of The Hester Bateman style with a bead border and bright cut decoration on the front of the handle. The rear with just the bead border. Knife is 8.375″ long. Fork is 7.5″ long. Good clear hallmarks on the rear of each piece. Antique mixed metals set of 12 knives and 12 forks made in Japanese Meiji period style. The knife handles made of silver, brass and copper and featuring incredible figural decorations: Depictions of flowers, birds and animals as well as fishing and sailing scenes. The silver plated blades are marked with the manufacturer’s mark Landers, Frary & Clark, Aetna Works, circa 1880-1890. 12 knives 8 5/8″ long. 12 forks 8″ long. Set Of 18 Pair Of Fish Knives & Forks In Solid Sterling Silver, Hand Forged By CW Fletcher In London England For Spaulding – Gorham Inc. This Is An Exceptionally Good Quality Set, All Sterling, The Handle & The Blade, With No Weighting Or Filling In The Handles. The Style Is A Very Good Style, Being The Pistol Form, But With Paneled Sides. The Maker, CW Fletcher Of London, Is Probably The Best 20th Hand Forged Silversmith, And Is Probably The Only Silversmith Still In Existence That Still Produces Hand Forged Silver. Fletchers Made Most Of James Robinson’s Silver In The 20th Century, And Is Now Owned By James Robinsons, And Called Fletcher – Robinson. Each Piece Is Fully And Correctly Hallmarked, Dated 1938. This Really Is A Very Good Set, In A Good Style, By A Very Good Maker, And Nice Being For 18 People. Knife Is 8″ Long, Fork 7.125″ Other English Sets In Various Styles Available..